Bulgaria, Germany, France, 2018, 91 minutes, Colour. This is an ethnographical film, portraying the life of Eskimos in the Arctic Circle as well as focusing on the changes in temperature, availability of animals for hunting, mysterious deaths of animals, and the younger generation moving into the city and to different kinds of work. The son has gone to the city but does pay them a visit with news of other relatives. 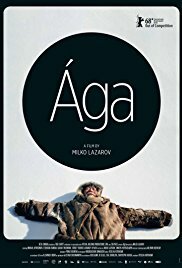 The couple endure a heavy storm, putting great strain on the wife who recounts a dream she has about meeting a polar bear, turning into a young man, his inviting her to his home, it being a vast hole, very deep, with all the stars of the heavens, where she loses her memory and her consciousness. It is clearly a premonition of death. When his wife dies, the older man decides to visit his daughter with whom the parents have quarrelled, Aga. He travels along way, spring coming on and, instead of snow and mountainous rocks, there are hills with trees, a road with a truck driver and a logging load, his finding the diamond mine where his daughter works, an extraordinary excavation, truck tracks on the sides of the mountain. He eventually sees his daughter. She weeps. And the camera with a helicopter crane sequence lifts out of the vast mountain up into the air, over the works, over the town, over the modern world. The film makes the point that the Eskimos lived an ancient way for centuries but this is now coming to an end with the younger generation moving out and into the cities as well as the effects of climate change.